Tonight for dinner it was a latin themed affair, mostly because I had a batch of sourdough bread that did not like the cold weather that hit us earlier this week. It was taking too long to raise, so rolled it out and made flatbread instead. We stuffed them with venison seasoned with freshly ground spices, goat milk cheddar cheese, sauteed onions and garlic scapes, homemade salsa and had a big salad on the side. 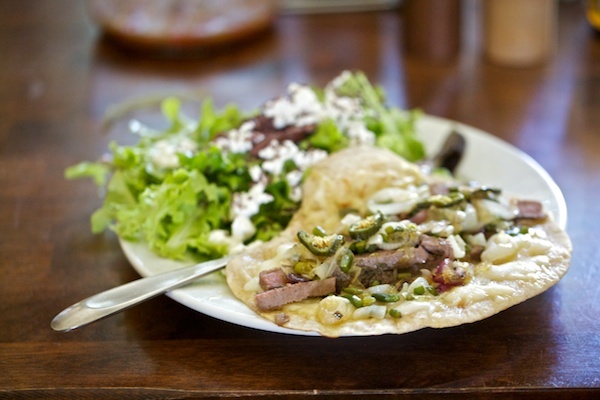 I must admit, the sourdough flatbread take the place of a tortilla quite well. Mr Chiots give them two thumbs up (though he thought the jalapeños were a big too hot). What have you been enjoying on your plate recently? After a few requests, now I’ll be adding a resource section to list the ingredients I use and where I get them. I’m in the process of putting together a master list as well, that will become it’s own page. We had trout tonight, courtesy of my husband’s friend and his obsessive fishing. It would be really sad to live on a lake so polluted that the fish isn’t safe to eat. Thankfully, that is definitely not the case for us. We also had a butternut squash that had been forgotten in storage and so has been hanging around since October. That’s some impressive longevity. MMMMM – trout, I would love to have some soon. Looks delish! I had shrimp & broccoli stir fry tonight. Last night I had a nice creamy shrimp salad topped with celery, avocado, red onions, garlic scapes & cilantro and m’honey had blue cheese crumbles & dressing on his. Would like to try making the flatbread. Were you making the norwich sourdough recipe, but instead rolled out pieces and cooked briefly in a hot skillet to make flatbreads? Yep, that’s exactly what I did Elizabeth! Thanks Susy. Do they keep in a plastic bag if you make them ahead of time? Yep, I made mine on Tuesday – that’s the beauty of sourdough, it keeps better than regular yeasted items.